In preparation for next week's PS4, PS Vita, and PC launch, the Curses N Chaos crew has published a quick post on the PlayStation blog talking about the game and its inspiration. Better yet, there's plenty of eye candy in the form of a new trailer and some prologue comics! 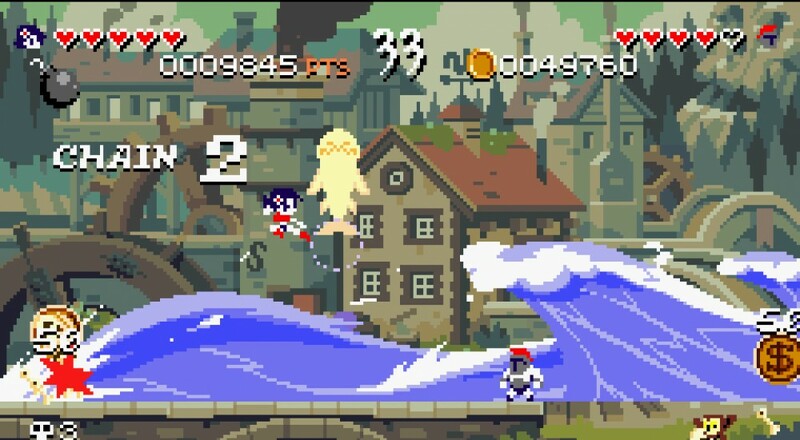 Curses N Chaos is a single screen wave combat game that supports two player online or local matches. The idea is you have to defeat all of the enemies so you can get enough ingredients to brew an alchemical potion that will break the spell cast on you by an evil king. To kill said foes, you'll be doing a lot of punching, kicking, and cooking to create powerful spells that will unleash hell in all corners. Curses N Chaos is meant as a tribute to the arcade days where players would crowd around cabinets after school, smacking buttons and lining up quarters on that little lip beneath the screen. In addition to quick-paced arcade action, the game also features a huge arsenal of items, big waves of enemies, and even bigger bosses. To modernize things a bit, the alchemy system lets you cook ingredients with a master alchemist named Allison in-between stages. Give her some gold and she'll mix things together so you'll have a fighting chance. In addition to all of the punching and kicking, the Curses team has rolled out a prologue comic that tells the tale of Alchemist Allison. Give it a read, then wait patiently for the game's PS4, PS Vita, and PC release on August 18.